exhaust extension for my Aspencade 1200 1984?? 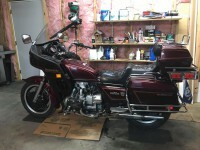 i have seen many pictures of some kind of exhaust extension for some Aspencade 1984 that would permit the exhaust odors to come out further on the back so you may not smell the exhaust when riding. anyone would have some picture? if you have dimension it would be great. Re: exhaust extension for my Aspencade 1200 1984?? if you're talking about the chrome pipes that turn down at the ends, only place I have seen them is Saber Cycles. $119.95 + shipping. would you have any photos? i would like to see how they fixed them on the muffler. I've no photos available. the pipes slip on using bushings and a clamp bolt. I located a pair of exhaust extensions on Ebay last year. There was 30 years of dust on the package but everything inside was still new. The set I have uses split clamps. i never seen that kind of attach braket,,fixation before. They were probably from Saber, many many years ago, and put on by a PO. They are a pain to clean every spring( bad chrome ) ...but are now carried by Saber at $ 150 (amer ) in stainless, not chrome, so maybe the newer ones will stay cleaner . They are fastened with a clamp bolt, each side. They don't extend very far back, so I cannot see how they would take exhaust gases very far back. IMHO, if you smell fumes ...lol... you are not going fast enough ! ! by what i can see these extension just install over the muffler tip and they are fixed at their end under the saddle bag of the GW ? by bolts?? whithout these bolts they would fall? Mine just go as far back as the end of my hitch ball platform , so the first thing you hit, on backing up is NOT the extensions, but that platform . I never smell anything on my (well tuned) machine... but I cannot see how mine would carry vapors and exhaust gases very far back. Are you planning on buying some, or making your own ? i tried to zoom your photo and see them ,,i cannot. yes i will manufacture my own,anyway buying in the US is too expensive because of the exchange rate and the famous shipping cost that have exploded. Anyhow i like to do my own things now that i am retired and not rich . necessity is the mother of ingenuity.